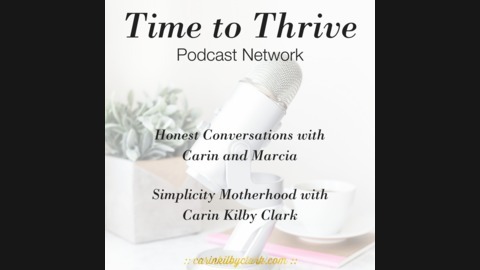 The Time to Thrive network includes the Honest Conversations with Carin and Marcia™ and Simplicity Motherhood™ podcasts. 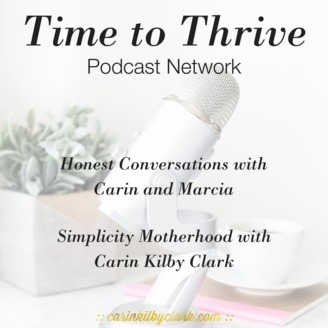 Honest Conversations: In Honest Conversations with Carin and Marcia™, we're talking about women's topics, entrepreneurship, motherhood, productivity, and anything else that comes to mind. We'll be interviewing experts who are further along on their paths so we can all grow and learn together. This podcast is about mapping the journey, connecting, and sharing. Not for the easily offended, this is an unedited, truly honest conversation between two mom entrepreneurs who are students of life. Simplicity Motherhood: Many of us busy moms are wallowing in mom guilt, poor self-care, distraction, and stress -- this has to change. Join me (your host, Carin Kilby Clark) and a lineup of rockstar moms who are authors, experts, and influencers for the Simplicity Motherhood™ podcast. In each episode, get a 30-minute dose of inspiration to create balance, reduce stress, and be happier. Topics include all things family, life, parenting, relationships, and more.